NIZHNY NOVGOROD, Russia (AP) — Antoine Griezmann’s fluke goal helped France earn a place in the World Cup semifinals. 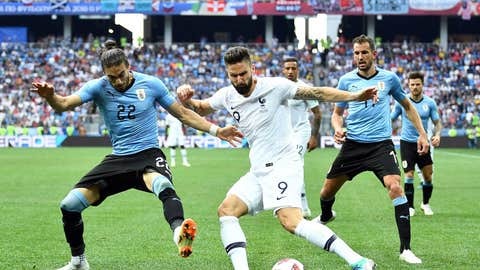 Uruguay, led by 71-year-old coach Oscar Tabarez, was trying to reach the semifinals for the second time in the last three World Cups. Heading into the match, Uruguay had been unbeaten in 2018 and had allowed only one goal in its first four World Cup matches in Russia. A country of only 3.5 million, Uruguay won World Cup titles in 1930 and 1950 and then waned. But it has undergone a revival in the last 12 years under Tabarez, a former elementary school teacher.